Tomorrow I’m observing the Bloggers’ Day of Silence for Japan. I’ve updated a previous post on ways to help; if you haven’t contributed already, please consider doing so. Pasta puttanesca is a perfect week-night dish–easy & quick to make, made with mostly pantry items, and adjustable for different dietary needs. It can easily be vegetarian, although the anchovy base adds “umami” dimension. 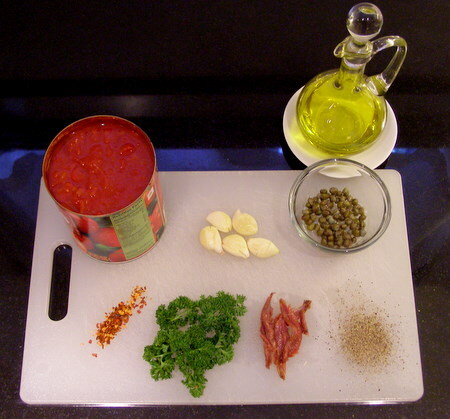 If you choose to forgo anchovies, you might try 1 to 2 tbsps olive brine, added with the tomatoes. 1. Prepare pasta according to box instructions. Drain, drizzle with olive oil, and toss to coat. Set aside. 2. Add 3 tbsps olive oil to a thick-bottomed pan. Warm over medium heat; add anchovy fillets and crushed garlic. Cook 2 minutes, smashing and mixing anchovies into the oil. 3. Add canned tomatoes to pan, and raise heat to medium high. Cook ten minutes, then add chili pepper flakes, salt, pepper, and capers. Let simmer 3 to 5 minutes more. 4. Stir in fresh herbs, if any. 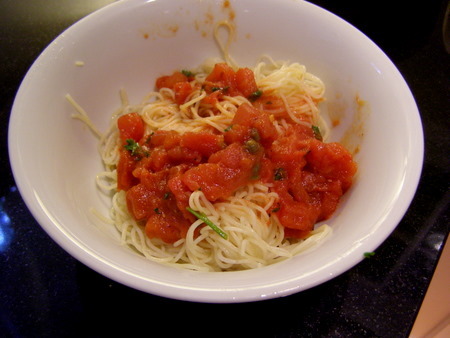 Remove sauce from heat and serve over the pasta. Mario Batali would have apoplexy over this amount of sauce. Sorry, Mr. Batali. Thanks Suzanne! Love the polka dot wrapping paper in your shop. Is Mario against pasta sauce? That’s the best part!